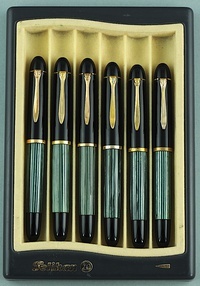 Following World War II and at the start of the German recovery, Pelikan introduced the Pelikan 140. They were made by the hundreds of thousands and were aimed at students, teachers and office workers. Today the Pelikan 140 is hands down our most popular model. 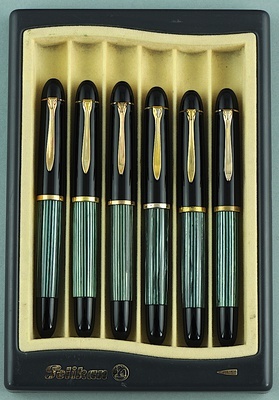 It offers classic Pelikan features such as piston filling, green stripes and flexible gold nibs at an affordable price. This is a superb workhorse, suitable for artists, writers, calligraphers, anyone who needs affordable quality. Many of our clients own more than one of these versatile pens. Contact us for nib flexibility and grades from EF to (occasionally) BBB.